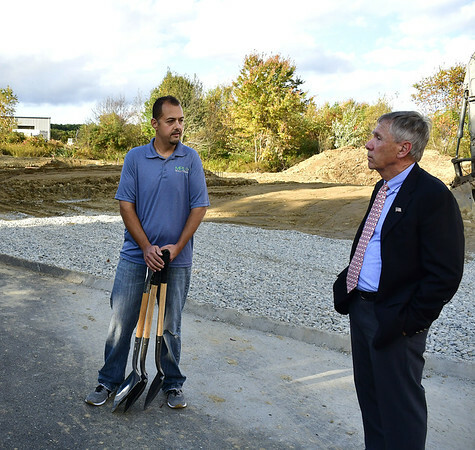 PLYMOUTH - MPL Solutions broke ground Wednesday on an expansion that will double its size in the town’s business park. Mayor David Merchant and Matthew Laukaitis, the company’s owner president, did the honors at 25 Lassy Court. Laukaitis said the building will grow from its present 6,000 square feet to 12,000 square feet to accommodate his growing business, which processes used computers, servers and work stations and sells the scrap materials to China. Merchant said that, when MPL moved in last year, it took over the last vacant building in the business park. Lassy Court will also be home to Graham Tool’s new 8,000-square foot-facility. Graham Tool is now in a building half that size on Container Drive. That building will be sold, Merchant said. “Too often I’m afraid towns take businesses for granted, but my administration has been highly proactive in assisting our local firms as they grow, as well as connecting with out of town companies to let them know about the many benefits Plymouth has to offer, and how business friendly we are. The word’s out that Plymouth is a good place to do business, and we’re seeing the results,” he said. Posted in The Bristol Press, General Business, Plymouth on Wednesday, 10 October 2018 21:18. Updated: Wednesday, 10 October 2018 21:21.